Beautiful tea cup! Barbara is very discerning and a sweetheart. Oh those No Bake cookies bring back aome fun memories. My kids and I loved them, alas, the grands and John do not so I do not make them anymore. Enjoy your tea! Good morning, my lovely friend! My, what a pretty and unique tea cup! Your friend Barbara sounds like an absolute sweetheart just like you :) It's truly amazing to be able to "connect" with so many precious women around the world thanks to blogging. Your no bake cookies look very tasty, my friend, and they are perfect to make during these hot summer days :) Love to you! Soon as I saw your lovely new teacup I knew it was Copeland Spode. I love their designs, and don't they feel good when you hold them? What a sweet friend! The cookies like great too. Haven't made them since our kids were still at home when I sued to make them often as the kids loved them. But my honey is not a fan of peanut butter, so...thanks for the memory! Have a wonderful week and thanks for linking to Tuesday Cuppa Tea! Oh, I will certainly be praying for your dear son Mike. Do you mean this week, as in the next four days? Hi Kitty, wow how exciting to receive such a pretty tea cup from a blog friend you never met. I love this recipe for the no bake cookies too. Thanks for sharing this at our Cooking & Crafting with J & J! Your teacup is so pretty on your table scape. The teapot reminds me of my best friend. She has one like yours that she uses nearly everyday. I have been praying for your Mike and will continue to do so. May God steady the hands of the doctor and may Mike heal quickly and be free from pain. What a sweet teacup from a special blogging friend! The scalloped rim of the cup is adorable along with the basket weave on the saucer. The blogging world does bring so many kindred spirits together. It's always so much fun to receive "surprise gifts" in the mail. Thanks for your no bake cookies recipe-so perfect for hot summer days when everyone is craving sweets. Sending prayers for your son's procedure this week. Wishing Mike well. I know all of this has been difficult for everyone. Love your new teacup -- it's a beauty! The scallops are wonderful. Happy Tea Day! What a treasure that teacup is, Kitty! And it's Spode too! Isn't your friend Barbara a sweetie to gift you with that? Your cookies look good. Pity my hubby doesn't like sweets with peanut butter in them. I especially like peanut butter and chocolate together. Thank you for sharing the update on Mike. I'm glad he will have his procedure this week. Praying for him and that he will have super results. Thank you for joining me for tea and have a beautiful day. Kitty, I am so pleased you like the tea cup. 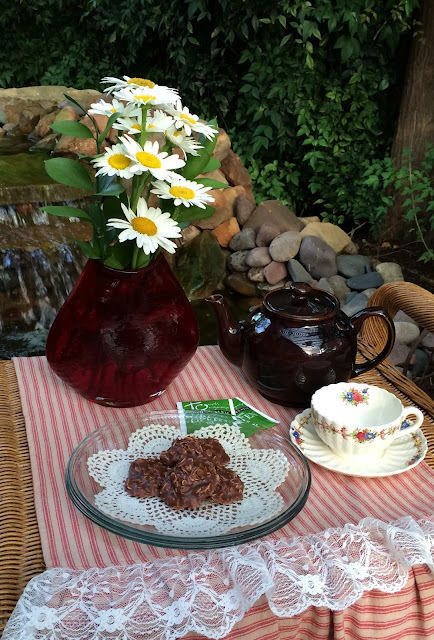 Wish I was there to share some tea and those no bake cookies! Good luck to Mike this week. I love the shape of your teacup/saucer. It is so feminine. I may be able to make your cookies since the use cocoa powder. Hope you are having a good week. Hope your son is doing well also. What a lovely teacup, Kitty! I'm also smitten with the scalloped edges and basket weave pattern. Gotta love how the internet brings together people from across the globe! You always have the yummiest snacks and now I'm craving chocolate peanut butter cookies! I'm not gonna lie--I always enlarge the photos so I can salivate over a bigger food image. Hee! I will continue to remember your son Mike in my prayers. You're always in my prayers and I will certainly add Mike and his medical team. With the back issues I have, I understand. I so hope the procedure is effective and he's out of pain. What a beautiful teacup, Kitty! I also love the perfect spot chosen to enjoy your tea besides the calming and wonderful waterfall! Wishing your son all the best with his upcoming surgery. May he finally be comfortable and pain free! This is a very attractive teacup, I love the colours. What a thoughtful gift. What a beautiful tea cup & thoughtful gift from Barbara! Enjoy! What a lovely gesture. I am sure your spirit is lifted when ever you look at this pretty cup. The no bake recipe is perfect for mid summer. I continue to pray for your son, I hope all goes well Kitty. What a darling teacup...so perfect for you, Kitty & what a nice gift from a dear friend! I remember making those 'no bake' cookies long, long ago. I had forgotten all about them. They would be perfect for today, as it is hot & muggy with storms brewing. Your outdoor waterfall looks so inviting about now! Hello Kitty. How wonderful to receive a teacup that so perfectly fits in with your taste. It's lovely. I remember those unbaked chocolate cookies - love them, and they are perfect for summer treats. How sweet of Barbara! Pretty teacup, too. I've made those cookies many times and love them. They are very chocolatey. Easy too. There are a few different versions of them, for example, no peanut butter; another example, add coconut. Prayers for you and Mike. I love that adorable teacup dear Kitty. What a sweet gift you got. I love this cooky recipe, I will soon try it and let you know. Prayers been sent for your dear son and for you, sweet Kitty. Ha! This is such a great idea! I love this! I loved reading about your teacup. These no-bake cookies look - and are - delicious! I love chocolate and peanut butter and have made these before. So easy and tasty. Prayers for your son!! Those plates are beautiful! I hope everything goes well with your son! It sounds like he's been through a lot. 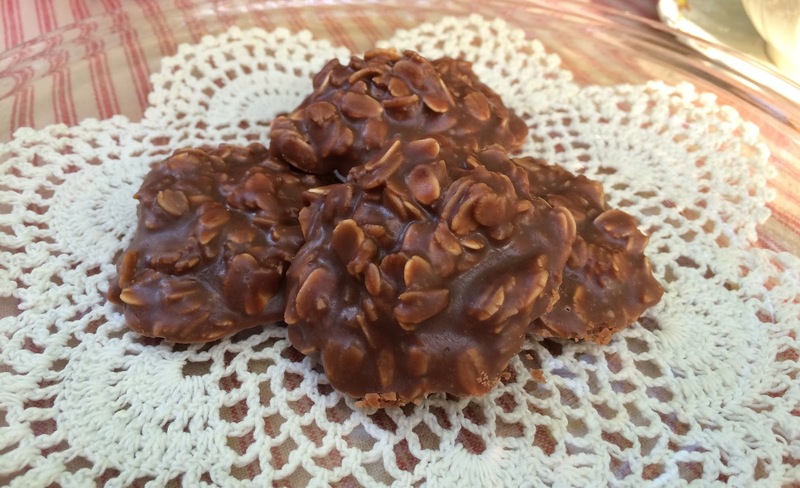 I adore no bake cookies, and these look delicious! Wish I had some tonight. What a beautiful surprise Kitty! And no bake cookies sound summer perfect! Good news about your son, medicine is unbearably complicated these days~ I will be praying for you all. P.S. Thanks for telling me about receiving my blog update. I don't understand why it says noreply@blogger.com I checked. Kitty, what a sweet friend! Love the teacup! The colors are so cheerful! I've never made no bake cookies before. Thank you for sharing your recipe! What a darling gift Kitty! Perfect choice, indeed. We use to make no bake cookies and I loved them. Haven't made them for years. Better makes some soon! Thanks for sharing with SYC. Aww! What a darling little tea cup dear Kitty...how perfectly splendid of Barbara to think of you and send it to you...oh...blogging is such a joy, especially when we meet kindred spirits with such caring, thoughtful hearts! What a wonderful treat and at a glace I though Copeland Spode. It is lovely. I loved your recipe too and posting about your treasure. Sorry to arrive at comments so late - my last couple weeks at my store have been time consuming. Almost retired though! What a beautiful Tea Cup from a very special friend and a perfect treat to have with your tea. I appreciate you sharing this awesome post with Full Plate Thursday and have a great day.